1. Shot a rabid dog. 2. Delivered a baby. 3.Put out a fire. 4. Pulled a rotten tooth. 5. Cut a man's hair (with a bowl). 6. Sell bootleg whiskey. 7. Fish a drowned child from a creek. I was intrigued with how much 'memoir' you could jam pack into the brevity of an autobiographical list. I petitioned for volunteers on Craigslist and Facebook to summarize their lives in 5 lines of text. (I was going to embroider the lists and figured less was good). Each list is marked with the author's age and first name. 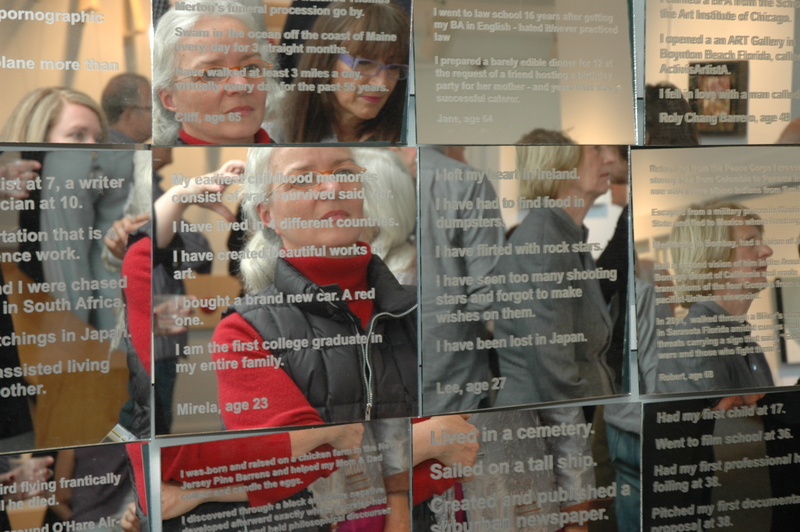 The resulting autobiographies were etched onto mirrors and placed at slightly off angles. Reading them, you can see your reflection, but only in fragments.